Will the city’s push for more consistent signage strip neighborhoods of character? 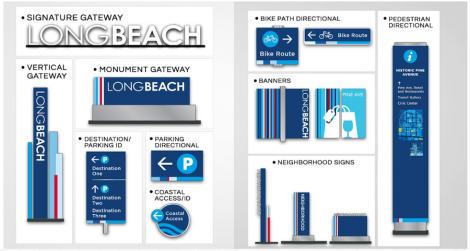 An update to Long Beach’s signage is winding its way toward implementation, but presentations to neighborhood groups have revealed there may be some work to be done to sway public opinion. The process to update the city’s signage began in April 2015 when Mayor Robert Garcia proposed the program to bring cohesion and clarity to the various city signs pointing to parking, beach access and notifying visitors of which neighborhood they were entering. A report to the City Council in 2016 estimated that completion of the project would come in 2017, but only a small sample of the signage has gone up, with some new parking signs being installed at Alamitos Beach. The more prominent neighborhood signs are being reviewed by neighborhood and business groups—and so far, they’ve drawn mixed reactions. Commissioners weighed in on the designs during last week’s Belmont Shore Parking and Business Improvement Area Advisory Commission meeting, where some questioned the sample size of a survey to garner feedback on the design. The lack of character in the potential new signs also have some worried. Belmont Shore’s current gateway sign has greeted residents and visitors for decades as they entered the Second Street corridor. The remaining wooden sign—its companion was blown over by a gust of wind—harkens to the Shore’s beach vibe with an anchor and sailboat sandwiching a banner. It is also infested with termites and will need to be removed. The city’s new signage and its patriotic color scheme and minimalist design is a departure from the unique gateway signs that greet people when visiting the Shore, Bixby Knolls or the Zaferia District. A screenshot from a presentation of the city’s new proposed way finding signs. Dede Rossi, the executive director of the Belmont Shore Business Association, is optimistic that as long as the individual neighborhoods are allowed autonomy over banners—something city staff expressed as a possibility—the change could be something that the public could get behind. She said the Belmont Shore community tried to decide on a new gateway sign for years, but previous efforts have been shot down. Rossi said the businesses will benefit from the signage pointing visitors to vital parking lots and directing them to areas that might otherwise be unknown to non-locals. Bixby Knolls Business Improvement Association Executive Director Blair Cohn said his neighborhood has yet to see a formal presentation from the city, so he couldn’t speculate on what the new signage could mean for Bixby Knolls. But Cohn said the district “marches to our own drum” and that it has worked very hard to create an identity. He estimated that Bixby Knolls could be one of the last portions of the city to be affected by the sign program and was optimistic that designs could change by then. The new signs, which are expected to be installed on a large scale potentially by next year, have been less controversial Downtown, where the area’s business association had a hand in the process. Sean Warner, the placemaking manager for the Downtown Long Beach Alliance, said the DLBA held numerous meetings with business owners and residents before the design process even began. He conceded that there will always be differing opinions about what the signs should look like, but added that the consistency provided by the signs will help people understand where they are. Warner said the DLBA is funding the initial phase for pedestrian signage in the Downtown area and that new signage might be seen in the East Village, North Pine and Downtown as early as next spring. The pedestrian signs will identify points of interest and how many minutes it will take to walk there.